There was a time when Neptune was nothing more than a pale blue featureless disc so far away that it remained a mysterious world. For a long time it had only one moon, Triton, and it was nothing more than a dim dot. To gain any knowledge of these worlds required constant monitoring by large telescopes and it was not until the Space Age arrived that there was an opportunity to fly a spacecraft past Neptune, Triton, and its smaller moon, Nereid. Still it was not a sure deal. The two Voyager spacecraft that were launched in 1977 were designed to study Jupiter and Saturn along with their family of moons. Flying out to distant Neptune was a long shot. If Voyager 1 succeeded at Jupiter and Saturn, and especially if it succeeded in exploring Saturn’s mysterious moon, Titan, then Voyager 2 could be programmed to fly to Uranus and then to Neptune. A flyby past Neptune was set for August 25, 1989, but it was not without risk. Voyager 2 was ailing with a faulty radio receiver and sticky scan platform. Pointing a camera at a dim object such as Neptune and its moons would require a camera on a scan platform that could move quickly to track the objects as it sped by. The amount of data required for a single picture would be enormous and the round trip communication of over eight hours would strain even a healthy radio receiver. Fortunately the 1980’s brought swift advances in computer programming and scientists were able to overcome the sticky scan platform dilemma by having Voyager 2 turn slowly to track an object while taking a picture. New programming also allowed images to be compressed before being sent back to Earth, thereby decreasing the risk of losing a valuable photograph while increasing the potential for more photographs. These concepts were tested when Voyager 2 flew past Uranus in January 1986 and everything worked beautifully. Further enhancements and advancements during the three years between the Uranus and Neptune flybys assured scientists that the Neptune encounter would be successful. A balky radio receiver was left on throughout the mission for fear that it might not survive being switched on and off repeatedly. The fuel supply aboard Voyager 2 held up and never became an issue. Neptune was virtually a world unseen and Voyager 2 was expected to yield surprises like it did at Jupiter, Saturn, and Uranus. It did not disappoint. The best views of Neptune before Voyager 2 arrived were nothing more than a blue disc with only a few hints of darker belts and a few white spots. Triton was even stranger as the light from it was analyzed and hinted at the possibility of it being covered with vast seas of liquid nitrogen. Neptune is far away from the Sun with an average distance of 2.8 billion miles. Daylight is no brighter than twilight on Earth about 30 minutes after sunset and temperatures hover around -350ºF. Neptune is about four times larger than Earth with a diameter of 30,690 miles. It never appears any larger than 2.4 arcseconds across or any brighter than magnitude +7.7 as seen from Earth, which is why it has always posed a challenge to study. Triton orbits Neptune in the opposite direction compared to the other major moons in the Solar System. It was suspected that it was a captured moon that possibly resulted in Pluto being ejected into its present orbit. August 1989 was a historic month for Neptune and Triton. Voyager 2 arrived and passed barely 3000 miles above Neptune’s cloud tops. Neptune was revealed to be a world of dark cloud belts, dark spots, and brighter clouds and streaks. Winds howl at an incredible 1400 miles per hour making Neptune the windiest of all the planets. It was thought that Neptune was too far away from the Sun and therefore too cold to generate any cloud features or storms. The powerful winds constantly change the shapes and locations of the clouds and spots. The most prominent feature discovered was the Great Dark Spot. It was an area of high pressure as large as Earth where the air was sinking and drying out the atmosphere below. This created a clearing or hole in the main cloud deck and the darkness of the spot meant that we were looking deep into Neptune’s atmosphere. 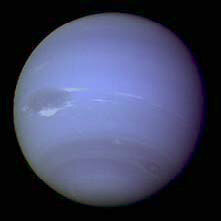 Methane causes the blue tint of Neptune since it absorbs the red component of sunlight and scatters the blue. The white clouds that were seen near the Great Dark Spot and elsewhere are methane ice crystals and do not appear blue because they are higher up where methane is less abundant. The ice clouds are formed either from rising columns of air from below similar to Earth’s thunderstorms or from the winds forcing the gas over a large dome of high pressure such as the Great Dark Spot. The gas condenses at the higher, colder altitude and freezes out as ice crystals. The powerful winds stretch many of these clouds nearly halfway around the planet. The dark belts are similar in nature to Jupiter’s as they are areas where the air is sinking and drying out, similar to the Great Dark Spot, but on a grander scale. Neptune appears more dynamic than Saturn and Uranus because it generates more heat internally than it receives from the Sun, similar to Jupiter. This heat may be the result of heavier materials sinking towards the core from Neptune’s creation, possibly being aggravated by a large impact eons ago. The heat generates the huge storms and ferocious winds. Triton stole the show from Neptune when mysterious dark streaks seen on the vast nitrogen ice cap turned out to be active geysers! The plumes soared five miles into the sky before winds carried them up to 100 miles downwind toward the night side. The geysers are powered by pockets of liquid nitrogen that are kept warm and under pressure beneath the ice cap. As the ice cap thins in the sunlight, the liquid nitrogen erupts into a towering geyser of explosive gas. This may have fooled scientists into thinking that Triton had vast seas of liquid nitrogen. Triton is a frigid world with temperatures as low as -392ºF, hardly 70º above absolute zero. Triton is 1680 miles in diameter and smaller than the Earth’s Moon, but it has an atmosphere of nitrogen that is 500 miles deep! It is thin, barely 1/100,000th of Earth’s, and only the lowest 15 miles contain a fine haze of methane and hydrocarbons. The vast nitrogen ice cap is slowly sublimating - changing directly from solid to gas - under the feeble summer Sun, and generating a steady wind that blows towards the colder night side where it condenses to create a new polar cap. 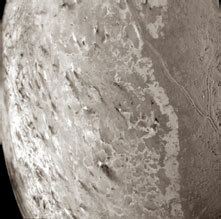 Triton has had a violent history as it is unusually smooth with very few craters. Vast expanses of terrain appear to have been melted and then frozen smooth with a mixture of methane, ammonia, and water. The Hubble Space Telescope has revealed changes on Neptune; the Great Dark Spot has disappeared and newer dark spots have appeared. Neptune has become increasingly banded and is looking more like a blue version of Jupiter. Triton has also grown warmer as it is -389ºF. These changes may be due to the fact that summer has arrived on both worlds. The dynamic nature of Neptune and Triton are beckoning for an orbiter mission, but distance makes it difficult to launch such a mission. To get to Neptune a spacecraft has to travel swiftly, but then be able to slow down enough to be captured by Neptune’s gravity. Jupiter and Saturn are much larger and their gravity is much stronger, making it easier for a spacecraft to go into orbit, but at Neptune the amount of fuel needed would make a spacecraft too heavy and large. At one time a Cassini-class spacecraft was planned that was to launch on July 25, 2002 and arrive at Neptune on May 13, 2021. It was to release a probe into Neptune’s atmosphere and orbit at least 40 times while flying close to Triton several times, but was it was not funded. Improvement in spacecraft design and miniaturization of components has made it possible to reconsider such an orbiter mission. It could fly to Neptune as quickly as in nine years, drop multiple probes into the atmosphere, go into orbit, and possibly deliver a lander to the surface of Triton. Such a complex, multi-billion dollar mission probably would not launch until the mid-2020’s, therefore arrival would probably be no sooner than 2035 at best, although once it arrives it could explore Neptune and Triton for at least four years. Massive blizzards rage in a blinding blue fury on screaming supersonic winds and geysers erupt into the frigid skies above a vast ice cap of methane where daylight is nothing more than an eerie twilight. This is the realm of Neptune and Triton that gives testimony that they are dynamic worlds that are continuing to evolve to this very day.